I have noticed that many web applications displayed in mobile devices or views seem to be simply moving or displaying the same content in a different viewport rather than trying to tailoring content for this use case/usage. A result of this is the deeply nested or long navigation menus that are easily displayed in desktop view (e.g. using a mega menu) having to be squeezed into a very small space, which means that you also have to navigate the navigation menu with a very limited set of interactions. 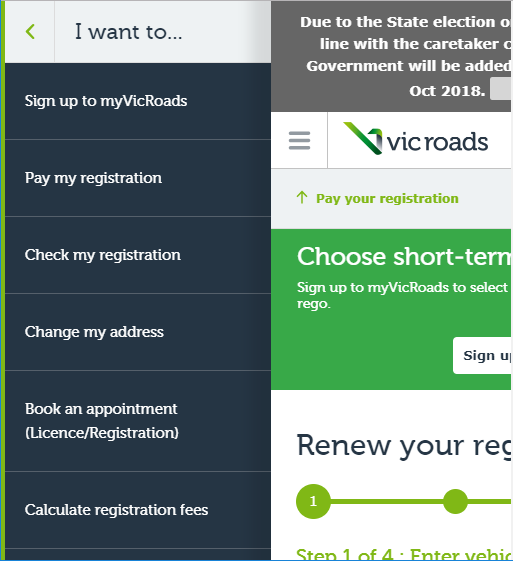 Below is an example of a navigation menu on mobile that has multiple hierarchies and therefore requiring additional navigation elements, but I am wondering if this is a standard design pattern that is used in established development frameworks or a workaround while we are working out where the next trend of mobile application design is heading towards. What is an common design pattern used for complex or deeply nested menu so that users can easily navigate the options (assuming that this provides a good user experience in the first place)? 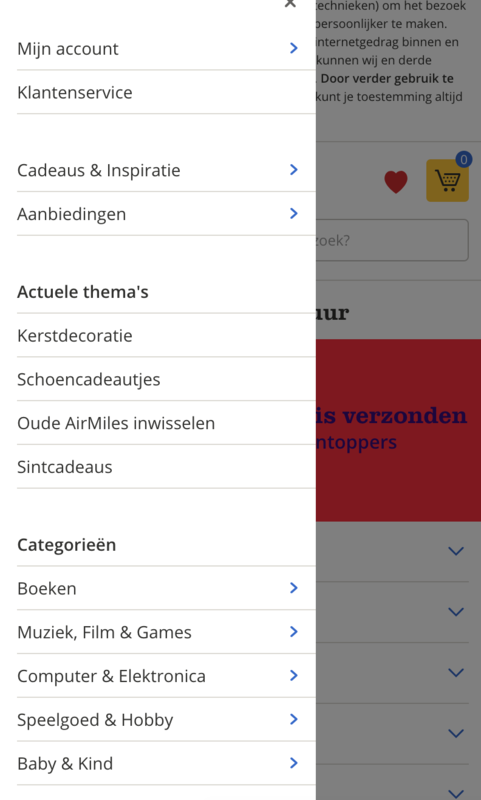 The pattern you listed is a fairly common implementation of a mobile mega-dropdown. Is it bad? No, I don't think so. You just need to nest all the topics into a logical order. If you take a look at e-commerce sites, you'll see a version of this pattern for nearly all of them. 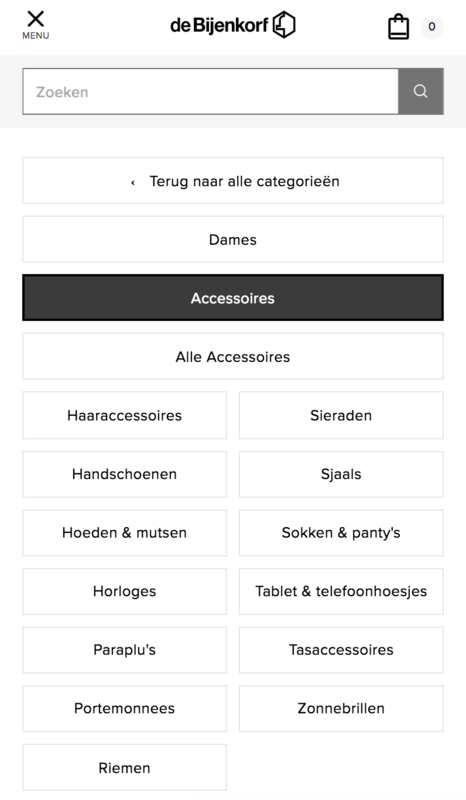 I've included some screenshots of Bol.com, a popular shop in the Netherlands. Sort subtopics underneath a 'main' topic level; e.g. : Books -> Genre, or Account -> Invoices, meaning it's easier to navigate through limited space. Allow users to take a step back within the menu, meaning they can easily recover if they selected the wrong item, or didn't find what they were looking for in the more detailed level. Adaptable to any kind of item, including account specific pages. Due to the nested design, you won't end up with an endless scrolling list. It does takes more time to find the specific page you're looking for. It does not show all items at once, meaning if you didn't group your topics in a way the user expects, they won't be able to find what they're looking for. If you have more than 2 levels, your user won't be able to see the highest level. They can only see one level above the current one. This doesn't necessarily have to be a bad thing, but it can lead to some users feeling more lost. Not the answer you're looking for? Browse other questions tagged navigation design-patterns menu mobile-web or ask your own question. Best way to present navigation for mobile? Is it appropriate to use an ellipsis in website left-hand navigation? Should we anticipate when the user is asking for the menu when we hide the navigation on scroll? Is it a good practice to extract some menu items from the main navigation on medium sized screens?